Earlier this week, Apple’s insanely popular AirPods truly wireless earbuds went on sale at a discount for the first time ever on Amazon. We told you at the time that they would undoubtedly sell out pretty quickly at that price, and we were correct. What we didn’t know at the time, however, was how quickly they would be back in stock at that discounted price! 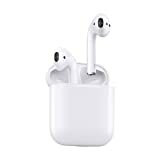 The Apple MMEF2AM/A AirPods Wireless Bluetooth Headset is back in stock on Thursday morning, and it’s back down to its sale price of $144.99. This marks a continuation of the first ever AirPods sale on Amazon, and it’s the best price we’ve ever seen for Apple’s cord-free earbuds. As was the case earlier this week, these are definitely going to sell out quickly, so you’ll have to hustle if you want a pair. So… what are you waiting for! ?